Selected poems from Raphael's five previous collections before 2000. "Dan Raphael is one of the finest prophetic poets composing in English. He focuses on his subjects so intently they dissolve and he rearranges the molecules into recombinant linguistic poetry for now and the future." "Musical, intelligent and perpetually mutable...Impulse & Warp is a gift of high art made of the raw materials...Essential sound from one of our finest singers." "Dan Raphael is from the great tradition--he doesn't want to think about or judge his work. He wants to keep making more: the unstoppable soul importance of the poet, the 'knowing your friends by the shape of their breaths.' Impulse & Warp is a wild wonderful ride, a kaleidoscope of words, sensations and ideas." "Dan Raphael's poetry lights up the dark abyss with sparks generated by blows from Vulcan's hammer. Watch out innocent civilians, friendly fire is headed your way." 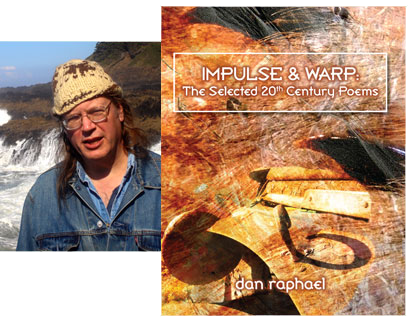 Dan Raphael's poems have appeared in around 300 publications including Caliban, Central Park, Heaven Bone, Lost and Found Times, Nebula Awards 31, Pacific Northwestern Spiritual Poetry, Tinfish, Otoliths, Portland Review, Unlikely Stories, Short Fuse, Raven Chronicles and x-stream. Among his books of the 21st Century are Showing Light a Good Time (Wordcraft of Oregon/Jazz Police, 2001), Among My Eyes (x-stream, 2002) and Breath Test (nine muses books, 2007). An energetic and intense performer, Dan has given over 200 readings, including places like Bumershoot, Portland Poetry Festival, Powell's Books, Cornell University, Red Sky Poetry Theatre, Reed College, Artquake, Southern Oregon University, Moe's Books, Portland Jazz Festival, and the Astrochimp Impact Crater. He edited NRG Magazinefor 18 years, then published 26 Books (26 chapbooks of 26 pages by 26 authors). Starting at college, he had organized readings and poetry events for over 30 years, including one monthly series that lasted 13 years, and Poetland, where 80 poets read in 8 venues over an 8 hour span. Despite degrees from Cornell, Bowling Green State and Western Washington, Dan has stayed out of teaching, working first for the post office and later for the Oregon DMV. He lives in Portland, OR, with his wife Melba and son Orion.